As parents, we have an obligation to counter the messages and images that our children are bombarded with, particularly now. If we don't put a stop to it, we're destined to have a whole generation that is not only insecure, but psychologically scarred as well. Here are some tips to help your tween/teen. Have you heard of the #KylieJennerChallenge? It's a hashtag that's become the call to action for young women who want to emulate the full-lipped look of the reality TV star. 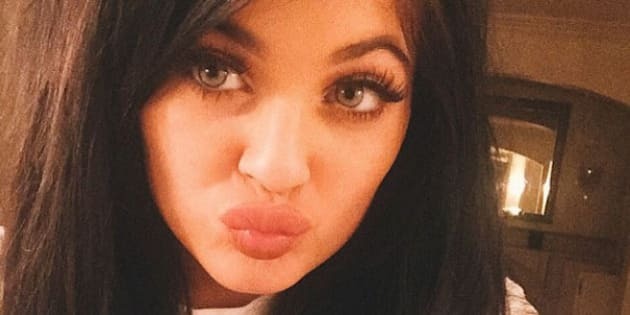 One of the famous sisters on "Keeping up With the Kardashians" and the younger sister of Kim, Kylie has become admired for her full lips and fashion sense; is it any surprise that tween and teen girls want to emulate her? Perhaps not, however the degree to which they want to be more like their idol is troubling, at best. In an effort to emulate the young TV star, teens have responded to the "Kylie Jenner Challenge" call to action that involves "participants placing their mouth over the opening of a cup, jar or other narrow vessel and sucking in until the air vacuum causes their lips to swell up. "(Daily Mail) The desired result is the pouty look that their young celebrity idol sports, seemingly without such painful effort. While it would be easy to write off such silly behaviour as harmless tween/teen antics, the reality is that this type of body mutilation in the quest for "beauty" is anything but. The physical pain and frequent injury that results from the #KylieJennerChallenge are the least of these kids' problems. Rather, as parents, we must look at the root causes of why kids feel the need to emulate their idols to such a painful degree. So what is really going on here? Why are young girls risking physical harm in the unrealistic quest to look like a celebrity who has the means and ability to look "just so" without pain or discomfort? We live in a society that is dominated by celebrity culture. Add to this fact our kids' ability to access the latest information, gossip and trends related to their favourite stars and you've got the recipe for a beauty disaster -- and then some. The digital age, including kids' love of social media, smartphones and the latest updates about the celebrity of the day adds to the desire to emulate what they are seeing. The famous have also been sucked into the digital vortex, with many stars using Twitter, Facebook, Instagram and other channels to connect with their fans. While this may be a great marketing tool and publicity generator for the celebrity, the focus on appearance, as well as an unrealistic standard of beauty is resulting in the damaged self-esteem of vulnerable kids. Perhaps spurred on by the constant feed of information about Hollywood beauties and otherwise, is it any wonder that impressionable tweens and teens -- girls in particular -- feel insecure about their looks and bodies? In the age of Photoshop, Instagram and unrealistically "ideal" bodies, it's difficult for the average tween, who is often already sensitive about their appearance, to maintain a positive self-image. Our celebrity culture doesn't help, highlighting the "perfect" and largely unattainable body types of the rich and famous, making young fans who are already vulnerable even more insecure than they already may be. It should be no surprise that insecurity and diminished body image exist in this age of "perfect" beauties, photoshop and plastic surgery. With images of celebrities being digitally altered before they are shared online and on social media, is it any wonder that our kids have a skewed sense of how real people look? Post-baby bodies that showcase washboard stomachs and curvaceous figures that echo shapes rarely found in reality feed into young girls' doubts about themselves and perpetuate an unrealistic standard of beauty. Tweens and teens idolizing celebrities is nothing new, but the standards of "perfection," made possible through technological and medical manipulation most certainly are. With the bar being raised higher and higher daily, there appears to be little hope for the average young person, insecurities and all, to ever reach the pinnacle of what they see to be the norm. As parents, we have an obligation to counter the messages and images that our children are bombarded with, particularly now. If we don't put a stop to it, we're destined to have a whole generation that is not only insecure, but psychologically scarred as well. Instances of eating disorders, younger and younger children going under the knife in the name of beauty and worse will become more prevalent if this celebrity trend continues. Do unto others. A great way of taking the focus off of oneself is to give back to others. Encourage your child to volunteer and their feelings of self-worth will increase considerably, guaranteed.